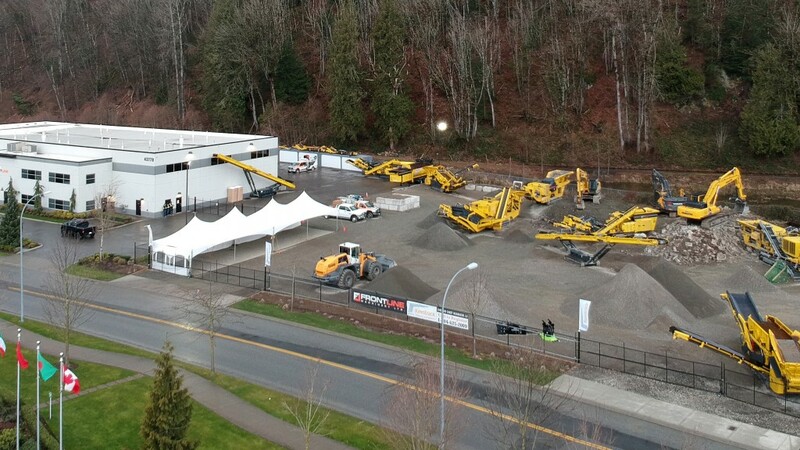 Aerial view of Frontline Machinery Demo Day last year. The star of the show will be the new Keestrack mobile H6e hybrid cone crusher. This high production crusher has a capacity of 400 tph with variable crushing chamber configurations processing feeds up to 215mm in size and CSS settings ranging from 6 to 44 mm. The crusher is driven by a 220 kW electric motor and all crusher functions are incorporated into the central Keestrack PLC controller, allowing for remote control operation. The optional Keestrack-er satellite-based telemonitoring documents all the key performance indicators in real-time and alerts the operator to any potential malfunctions. A 345 kW Volvo diesel engine (EU IV) with a connected 500 kVA generator supplies the onboard energy. The entire drive unit is designed as a removable module. Located remotely from the crushing plant and its abrasive environment, dust and vibration levels are reduced, maintenance accessibility is increased, and the service life of the drive unit is greatly optimized. Also, included in the line up is the Keestrack track-mounted R6e electric impact crusher. Offering up to 45% energy savings over diesel hydraulic models with a capacity of up to 500 tph, the R6e is available with a 250-kW electric motor for the crusher and an electric 110 kW drive for the on-board hydraulic system. It also offers an optional all-electric plug-in operation from the mains and a plug out operation for powering secondary machines such as a stacker or screener. Due to having the largest and heaviest rotor in its class, this machine is ideal for aggressive primary and secondary crushing applications including concrete and asphalt recycling and quarry applications. Eat some of the best BBQ in town!